When a coworker retires, coworkers generally sign the retirement card, participate in the scheduled festivities, and send personal greetings and gifts to honor the retirement occasion. Traditionally, when the momentous occasion of an employee retirement occurs, it is marked as a life passage into the next chapter for the employee. They use the retirement as one last opportunity to express care and appreciation for a valued coworker. As a consequence, employers and coworkers, who know not what the future brings, want to wish the retiring employee a happy retirement. This is greatly appreciated by the employee who has decided to retire. But, the employer and coworkers are often more hesitent about how to deliver their retirement wishes effectively and successfully. You will want to make your coworker's retirement memorable. 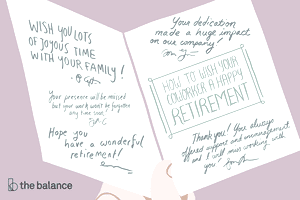 Use these sample retirement wishes to send a happy retirement message to a valued colleague. Here are sample retirement wishes that you can customize for your own use when you have the opportunity to wish a treasured colleague all of the best in retirement. These retirement words wish the coworker the very best thoughts for the future. Read through these sample retirement words and wishes to find sentiments that echo your own feelings about a coworker. We're really going to miss you! Hope you'll enjoy every minute of your retirement. Best wishes! I hope you have a wonderful retirement! You will be missed, but never forgotten. You've done so much for all of us. Your guidance and encouragement have helped me and so many other coworkers thrive in a very competitive environment, and we've been so fortunate to have your expertise to rely on. You'll be missed, but I know your retirement is the right thing at this time. May the next phase of your life bring you all that you seek and more. Recently I wished you congratulations on your retirement. But, I also want you to know what a blessing it's been to work with you over these past few years, and how much I will miss you. Then you responded to my note, and wouldn't you know it, your uplifting words encouraged me more than you could imagine. That's the special kind of person you are! You helped me so much and your thoughts were always well thought out and to the point. I truly appreciate everything you did for me over the years. You will be missed. I hope that you have something wonderful planned! We'll miss you. But, the time is right for you. I sincerely hope that retirement is wonderful and I wish you lots of joyous time with your family. Just wanted to say that I found so many of your ideas inspiring. It's hard to imagine our workplace without you! I hope retirement brings you the chance to do whatever it is that you always wanted to do but didn't get to. All the best! To say you will be missed seems like such an understatement. You are one of those rare people who instantly became a friend instead of "just" a coworker. There are no words to truly reflect how much we will miss working with you. Not to worry, though, I'll stalk you on FaceBook. Now, get out there and show the world just how much fun is possible. You have made such a difference with your constant optimism, enthusiasm and willingness to answer questions, no matter how stupid. Somehow, you were able to make what seemed complicated into something we could all be excited about and get behind. I know we'll all really miss you. Thank you for everything you've done and enjoy yourself! It has been a joy to work with someone so passionate, calm and professional all at the same time. While I've only had the chance to work with you briefly, it's clear that your dedication to our customers has made a huge positive impact on our company. I hope retirement brings you wonderful things. You will be greatly missed. You have been so wonderful to work with—so many brilliant and creative ideas and suggestions that I've lost track - and you will be sorely missed. It has been an honor and a privilege to work with you. You're also a wonderful friend and I appreciate your friendship and caring more than I can say. Our friendship, which is near and dear to my heart, will continue, I know. Working with you was such a pleasure. I always appreciated your thoughtful, steady approach to solving any problem large or small. You proved that it doesn't take a loud voice to accomplish tremendous things. Best of luck, and enjoy your retirement! It was great working with you—your work truly made a lasting impact, and one that has changed the company for the better in so many ways. I always appreciated how you were readily available to lend an ear and help solve any problem. We will miss you very much, but I wish you the best in retirement! Thanks for everything! I just want to say, "Thank You." You always listened, you always had something constructive to say, and you always offered support and encouragement with an unflagging spirit. I've learned so much from you, and I will miss working with you. Keep in touch, please. Now go... go on, get the skis out, find the canoe, get started on the "to be read" pile. Enjoy! You deserve it. Working with you has been an immense pleasure the past couple of years. Your graciousness about the people with whom you work, your delight in and acknowledgment of their successes, and your ability to make them the heroes, has always impressed me. Your work brought a huge, new capacity to my work that is helping me to live out my own personal and professional mission. And, my audience benefits from your contributions every day. On a personal level, I have enjoyed our friendship and will delight in continuing it into your retirement, even when we no longer work together regularly. While your lovely presence will be missed in the office, the great work you did here ensures that you will not be forgotten anytime soon. What you achieved at this company made quite an impact, and that’s not so easy to do these days. Thank you for being a tireless professional, a helpful coworker, and a good friend. Now go and relax! Did you enjoy this article? You'll want to sign up for the free newsletter now because you want to read all of the new articles as soon as they are available.